Time is flying by so fast here at Le Cordon Bleu. Week 5 seems long ago and was all about soups and compound butters. Well, "soup" is not the right term; "potage" is more accurate. Soup, a type of potage, is derived from the word souper, which means to absorb. 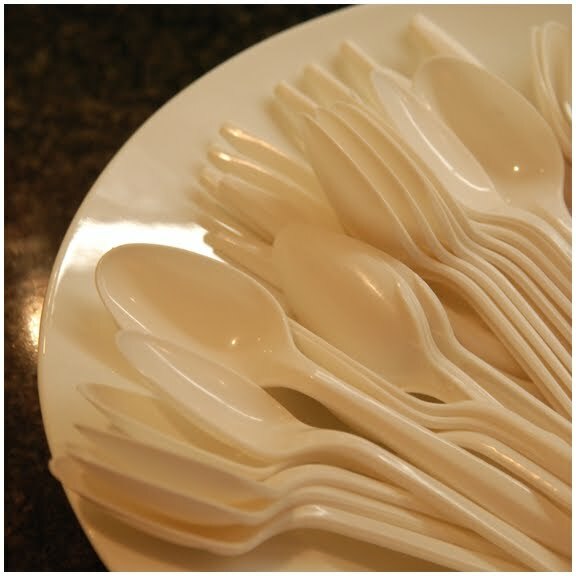 To be called a soup, it must contain bread (such as French Onion Soup or Fish Soup). A potage is either thickened (called a lié) or unthickened (clair), such as consommé. 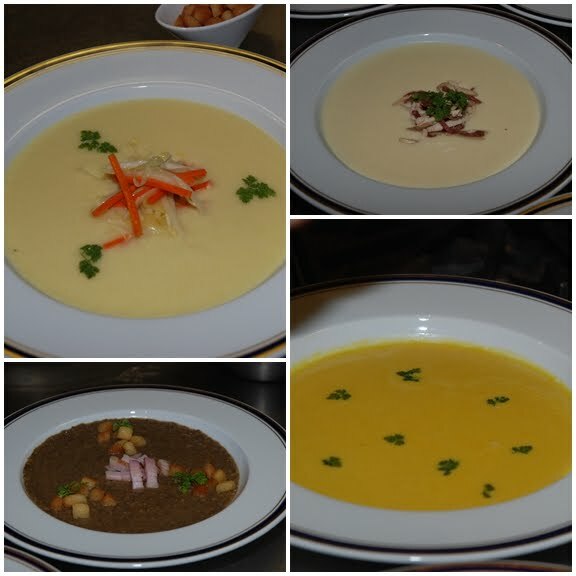 For the practical, we had to make Potage Julienne d'Arblay, which is the classic leek and potato soup (known as Vichyssoise when served cold). The hardest part of this practical was cutting the carrots, turnips and leeks into julienne. However, the length of my turnips were shorter than my carrots, so I lost marks on that. As well, I over-salted my soup. And I sautéed my croutons in too much clarified butter so when I presented my dish to the chef, he pressed a crouton in his fingers and showed me all the butter left on his hands. I thought that the more butter, the better! 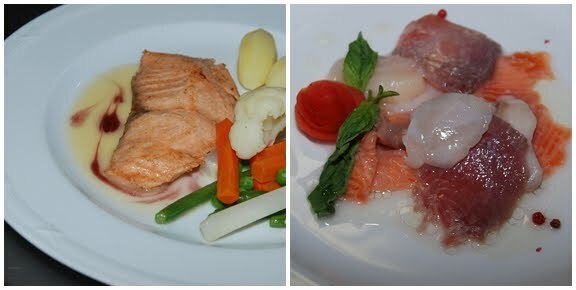 Here are some of the dishes the chef made during the demo. The next demo continued the Potage theme along with a lobster execution. First, the lobster. Instead of killing the lobster by dropping it in a pot of boiling water, the chef cut through its nervous system from head to tail first and then twisted off the claws and tail. He explained that when the lobster starts to die, its meat starts liquefying. That's why it's important to get a fresh lobster and kill it just before cooking. To be called a bisque, it must contain a crustacean since the shells are used to flavor and thicken the potage. In fact, the chef used a heavy-duty blender to crush the shells before straining through a fine-meshed strainer (called a chinois). He also described his disgust at seeing "Red Pepper Bisque" on a restaurant menu since it doesn't contain any crustaceans! My favorite potage at this demo was the borscht. It was rich, slightly sweet and filling. The onion soup was a close second. The potage of the day was the consommé since that was the one we were assigned at the practical. Not exciting, but it requires a few techniques to make it clear, not dirty. First, the mixture for the raft that becomes the filter for the impurities should be slightly gooey. By stirring this mixture on the heat with the stock, you ensure that it doesn't stick to the bottom. As soon as it starts to cook and the whites are on the surface, leave it at a very low simmer for about an hour. Do not boil it and stop before the raft starts sinking back into the liquid. After ladling it out into a separate bowl and using a paper towel to capture any fat, taste it and serve. While the consommé was simmering, we practiced our knife skills by preparing a plate of carrots cut into julienne, brunoise, paysanne, turned, and battonet. My consommé tasted perfect and was clear! For the last demo of the week, we learned all about butters, including compound butters and beurre blanc (which is a beurre monté not monter au beurre!). Compound butters are simple as long as you add the reduction after it has cooled. Another trick I picked up during the demo was how the chef sautéed the salmon. He used a lot of clarified butter and ladled it over the salmon frequently. This moves the hot fat from the bottom over the cooler part of the item being sautéed, cooling off the fat so that it doesn't get too hot. I'd never seen anyone do that before, and it's a great trick. The thing to remember with beurre blanc is to not change the temperature of the sauce quickly. If the sauce goes from hot to cold, it will break. The practical had us sautéing salmon, making a beurre blanc, turning potatoes, carrots and turnips and cooking cauliflower, green beans and peas. Unfortunately, I overcooked my salmon, but my beurre blanc didn't break and was seasoned well. Again, my turning needed work...it's my weak point. Overall, it was a much better week than the last! After the chef is finished making all the dishes for the demo, everyone with cameras scrambles to the front to grab a photo. When the camera-happy people (me included) are satisfied, then everyone grabs a spoon and tries to squeeze in for a nibble. It's pure chaos with 27 people competing for a bite, hoping the person in front of them doesn't double-dip! 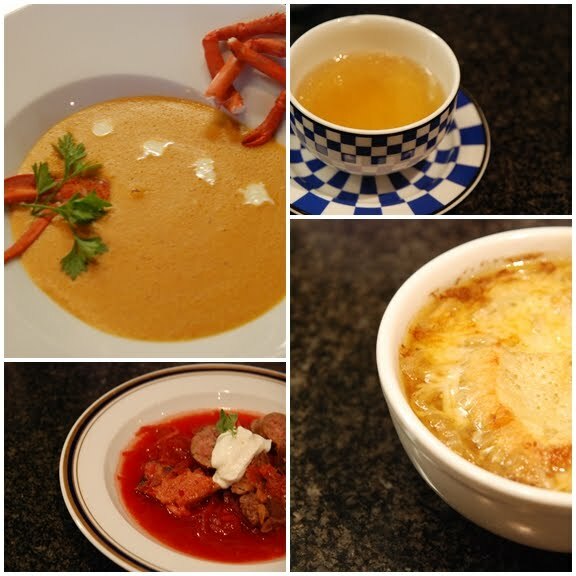 Part 3 - Soupe à l'oignon gratinée (Onion soup) and French Onion Soup—Veal or Beef Stock? Love the stories! Borscht is my fave. This one looks so red and beautiful. I can imagine the tasting frenzy~! How fun! Thanks for sharing your experiences. I am so excite to try you lobster bisque recipe. It is one of my favorite soups and I try every recipe that I can find. So interesting to learn the specifics of soup and potage. Thanks for sharing the information! Your posts are so very much more real to me because we cooked some of these dishes together! I can feel some of the tension (although you do a fabulous job of relating just the facts) of performing to the chefs' exacting standards...a bit too much, not enough... At home we are our own critics and it doesn't matter. I'm amazed at the difference between "soup" and "potage"! Omgosh! Thanks so much for taking the time to share with us! !